File MS-2-744, Box 107, Folder 7 - Correspondence concerning "Encyclopaedia Universalis"
File contains correspondence with Claude Gregory, John Dodge, F. Weizsacker, Jean R. de Salis, John Kendrew, P. Kapitza, Salvatore Quasimodo, Daniele Bovet, Georg Likacs, D. Lavergne, Linus Pauling, S. Radhakrishnan, C.F. Weizsacker, Werner Heisenberg, Robert Forbes, Robert Hutchins, and Theodor Svedberg. Correspondence mainly includes invitations to join the Encyclopedia Universalis' project. Also includes comments written about the encyclopedia by Marcello Colocci (on the "Physics" and "Chemistry" pieces) and Guiseppe Barbreri (on the "Geography" section). 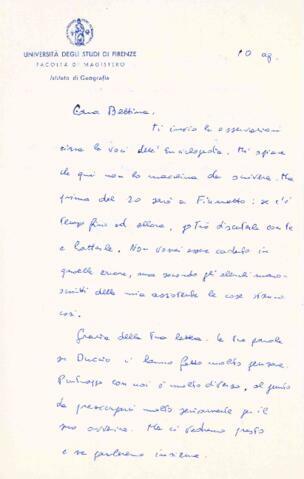 Contains English, Italian, and German correspondence.